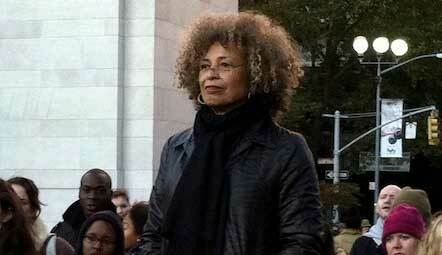 LAWRENCE, Kansas – Professor and political activist Angela Davis addressed the University of Kansas here Feb 7 on the problems of feminism in capitalist society. Davis, a former political prisoner, is active on prisoner rights and was a two-time Communist Party vice presidential candidate. Davis commemorated the 40th anniversary of an event in which 30 members of the feminist group, February Sisters, occupied the University of Kansas’s East Asian Studies building. They called for the creation of new facilities for women, and did not leave the building until they were guaranteed an audience with university administrators, according to the University of Kansas History Collection. “Looking at their demands, I am not only impressed by the Sisters’ militancy and courage, but I’m also impressed by the extent to which the demands they formulated then reflect concerns that, 40 years later, still have not been resolved,” Davis said. A point to which Davis returned throughout her speech was the need for feminists to be conscious of class and race as well as of gender. Davis also stressed the interdependence of the various issues that constitute the struggle for women’s rights. “In 1971, I was in jail,” said Davis, drawing scattered laughter from the crowd. “While I was in jail, I tried to participate as much as possible in movements that were unfolding in the so-called free world … There was a huge reproductive rights rally scheduled in San Francisco. I was in Marin County, just across the Golden Gate Bridge. “I was asked to write a statement that very specifically engaged with the issue of abortion rights. Of course, I was in favor of women’s abortion rights, but I did not want to take women’s abortion rights out of the context of the broader conglomeration of issues that constitute women’s reproductive rights. “At that time, we had learned that vast numbers of Native American women had been sterilized. We’d also learned about the extent to which Puerto Rican women were used as guinea pigs by pharmaceutical companies in the production of what was then the new birth control pill. So, I wrote a statement in which I tried to make connections between women’s reproductive rights and women’s right to be free from forced sterilization. The statement wasn’t read. Davis also discussed the construction of histories within capitalist societies. According to Davis, capitalism depends on the belief that past rights struggles have been resolved, leading to present conditions under which change is no longer necessary. In this vein, she said, the struggle for racial equality has been artificially framed as a phenomenon that is no longer relevant and ongoing, and hermetically sealed in the past. “We want to have a nice Hollywood closure to past struggles so that the problems of the past don’t bleed into our current lives,” said Davis. “Martin Luther King, Jr. announced, at the end of his life, a poor people’s campaign. This is why, when he was assassinated, he was working with a group of sanitation workers who were trying to get their union recognized in Tennessee. Davis made it clear that, even 40 years after the February Sisters occupied KU’s East Asian Studies building, the struggle to defend women’s rights, and the rights of all workers, is far from having concluded.